I received my notebooks that I won from the Facebook page Heather’s Home, and the quality of them is excellent. Because they are personalised as well this makes them so much better! I’m really happy with the service provided and I would use this page again. Even though I won these particular ones but I would consider buying for friends and family because of the ability to personalise the books. 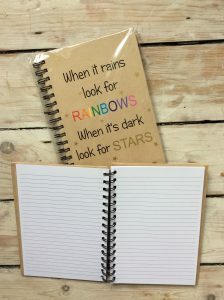 “When it rains look for Rainbows, When it’s dark look for Stars”. 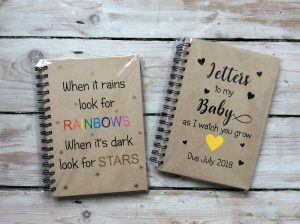 “Letters to my Baby as I watch you grow. Due July 2018”. If you want to visit this lovely page for yourself then here you go. Thank you for visiting Severn Wishes today, I hope you have enjoyed this content. Have a lovely day. This entry was posted in Reviews, Stationary, Winnings by Sabrina. Bookmark the permalink.